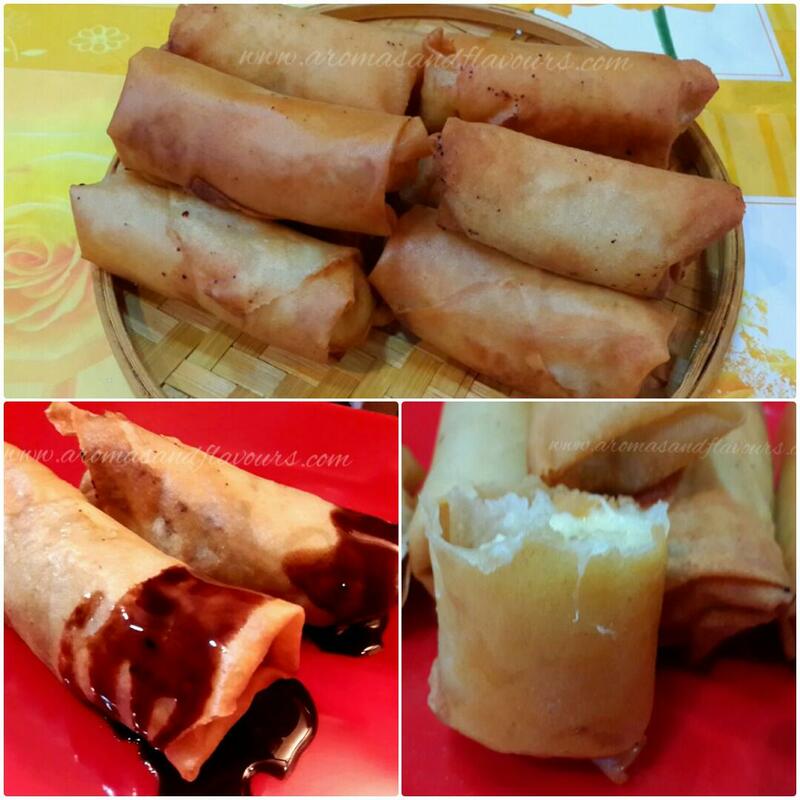 Turon or banana spring rolls is a popular Filipino dessert sold on mobile food carts which line the streets of Makati’s Central Business District. They are fondly known as Jolly Jeeps. Jolly Jeeps were originally wooden carts started with the purpose of providing meals on wheels to the blue collar workforce (laborers, janitors, clerks and low-level employees) who looked for economical lunches because the office cafeterias burnt a hole in their pockets. With the passage of time, these Jolly Jeeps became popular with the white collared employees, managers and executives who drove up to them in fancy cars to savor the delicious food served there. In the early days, these carts were unregulated and untaxed. The vendors would just park them in their slots where the employees from neighboring offices would hop down in their free time and buy a meal. As they did not have permission from the city government, they would drive their carts to the next block and set up their business there, whenever the cops would drive by and shoo them away. Eventually, the Jolly Jeeps evolved and lost their wheels. 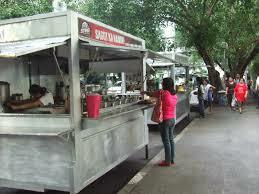 Now they are stationary aluminium booths which are taxed by the government and regulated by the local health authorities.They are the pride of Makati city. Turon or banana spring rolls is one such delicious snack served in these jeepneys. 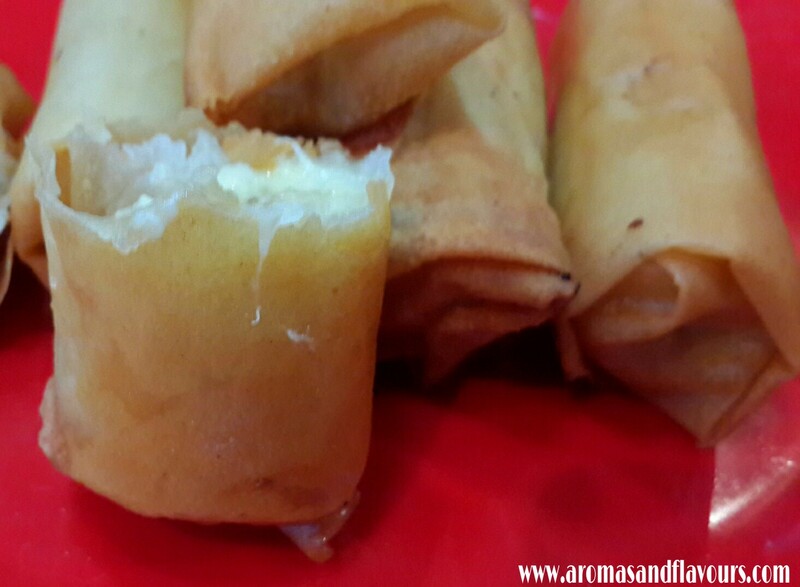 It is made with spring roll wrappers stuffed with banana and/or a slice of jack fruit. There are many variations to this dessert. You can experiment with the fillings. It is traditionally made with banana coated in brown sugar, but I prefer white sugar because it keeps the pastry golden in color after frying. The brown sugar version tastes equally good but the pastry turns reddish brown. You can serve it with chocolate sauce or with ice cream. The hot crunchy springroll with a sweet gooey filling served with cold ice cream of your choice can be an ultimate experience. 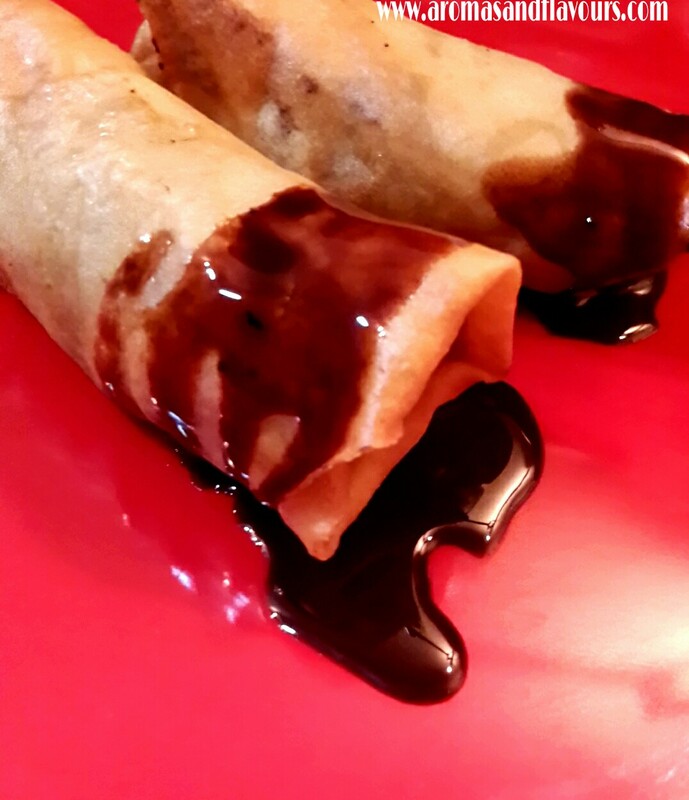 If you happen to try this simple, delicious,easy to make recipe do let me know which option you liked better-the one with chocolate dipping sauce or the one with ice cream. 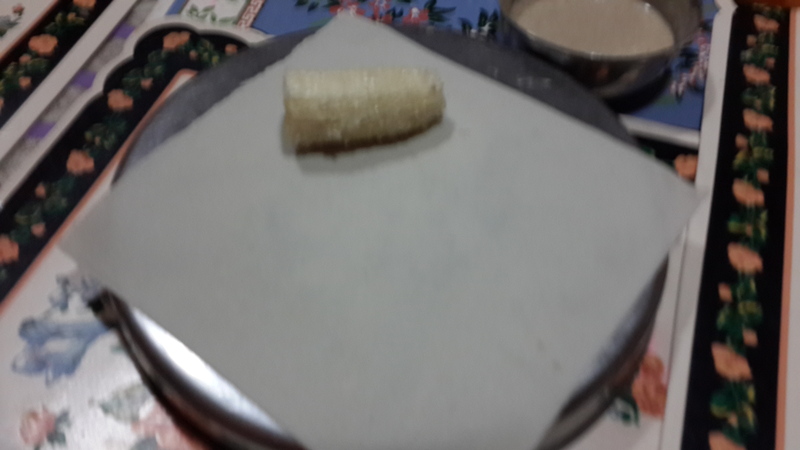 Roll each banana half in sugar till well coated. Work with one half at a time. Otherwise the sugar can melt and make the wrapper wet. 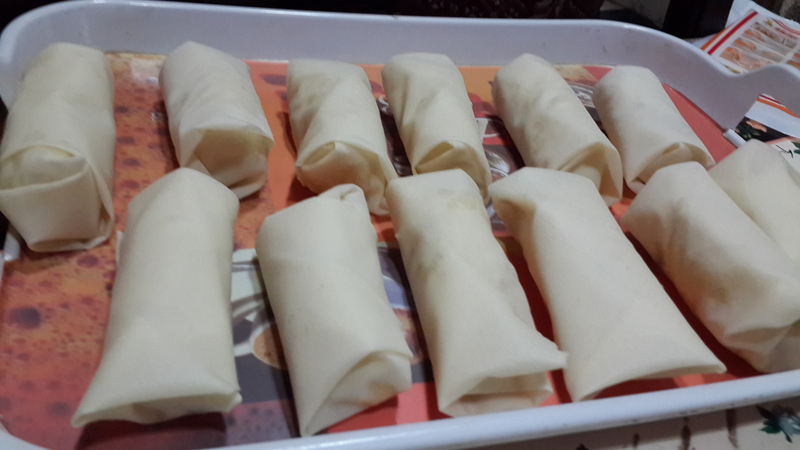 Place one half of a banana on the spring roll wrapper and add some jack fruit if desired.Fold from sides and roll. Make a tight roll and seal it with water or a paste made with flour and little water. Make all the rolls similarly. Work fast. Do not let the rolls sit for a long time. Deep fry in medium hot oil till golden brown. Serve immediately with a scoop of ice cream or some chocolate sauce. Enjoy this melt in the mouth dessert from Philippines.. Thank you so much. That’s such a kind thing to say. Ana, these look amazing! I loved reading about the jolly jeeps. 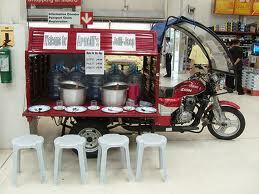 Reminded me of the carts in India. I can smell the aroma of the jackfruit in these yummy goodies! Thank you Sandhya . They can made with mangoes too. Very tasty. The Indian pushcarts (bandis/thelas) still exist. The vegetable thelas,the banana thelas and the kind. Good old India. Mangoes and jackfruit are my favorite! Have to try making them! Thank you for sharing the recipe. Great post! Interesting back story. Delicious-sounding recipe. Lovely images. PS: I like your watermarks. Hope you feel better about that. Looks so delicious! I have never tried this before… I am not a very big banana fan..but probably I can giv this a shot! Thank you Lina. If you are not fond of bananas you can use mango instead. This is new to me and so worth trying. It really is worth trying Hilda. 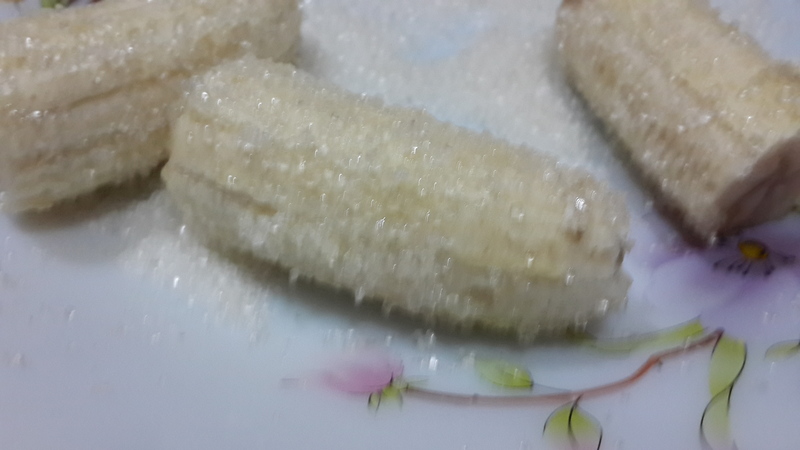 The banana melts inside and becomes soft against the crunchy covering. Totally yummy. Thank you dear. I am sure you will love it. Although I hate bananas, this looks delicious! Thanks for sharing this wonderful recipe… I might ask my mom to cook it for me someday…huhhhh…someday. lol. Jolly Jeeps – these have to be good and with chocolate, of course! We have so many different tastes when it comes to Turon in my family. Some like it dipped in chocolate others with ice cream. Then my kids dont want Jackfruit in them. I love to try all the variations. Each one is delicious. Thank you Justine. 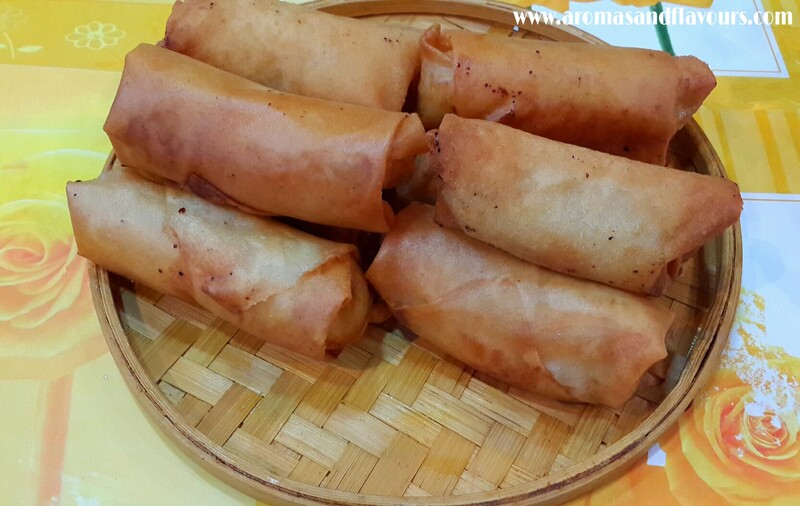 The good thing about banana spring rolls is that it melts so beautifully making it deliciously gooeey with a crunchy cover. Oh my word, this is calling my name…. so where would you get the jackfruit from Ana? Yummy! Jack fruit is an Asian fruit available extensively during these months. It is also grown in some regions of Australia. Nowadays it is available online across the world either fresh or canned . However you can still make Turon without the Jackfruit. It has a strong aroma and flavor. So it is relished by some people and disliked by some others. Me and my husband just love it where as my kids don’t. So I make Turon both ways with and without the Jackfruit. I’m glad you described them as turon is something very different to me (Spanish version). These sound delicious, I love the idea of banana and jackfruit together in them.